Deposit Taken - Vehicle Reserved. Just 48156 Miles. 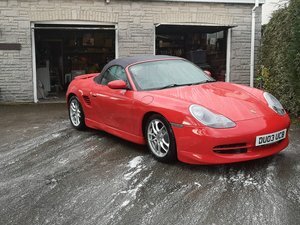 2006 56 Porsche Boxster S 3.4 S Convertible - Tiptronic S Automatic. Finished In Cobalt Blue Metallic with Black Leather Interior and Black Cloth Power Hood. Standard Specification Includes : Power Hood, Automatic Climate Control with Active Carbon Filter ( Cabin ), Radio CD, Partial Electric Front Seats ( Electric Backrest Operation ), Front and Side Airbags, Leather Bound 3 Spoke Steering Wheel with Tiptronic controls, On Board Trip Computer, Electric Rear Spoiler, Seat Belts in Black, Instrument Dials in Silver, CD Storage Box in Glovebox, 2 Way Manually Adjustable Steering Column, Glass Rear Window. 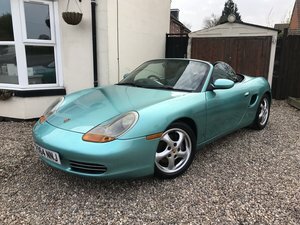 Optional Extras Include : Cobalt Blue Metallic Paint, Black Leather Interior, Tiptronic S Automatic, PCM 2 DVD Navigation, PCM Telephone Module, 6 Play CD under Bonnet, Bose Surround Sound System, Porsche Stability Management ( PSM ), Park Distance Control - Rear, Wind Deflector, Illuminated Vanity Mirrors, Coloured Wheel Centres, Upgraded 19 inch Carrera S Alloy Wheels with Red Brake Calipers. 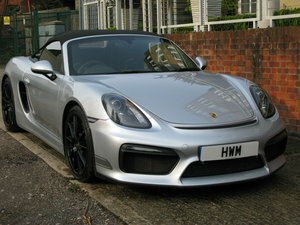 Service History detail as follows : 28.07.2008 - Service @ 8962 Miles by OPC Porsche Main Agent. 15.04.2010 - Service @ 29417 Miles by Independent Service Station. 15.05.2012 - Service @ 36795 Miles by Honda Main Agent. 21.02.2014 - Service @ 38810 Miles by OPC Porsche Main Agent. 29.03.2014 - Service @ 39082 Miles by OPC Porsche Main Agent. 29.04.2016 - Service @ 44100 Miles by OPC Porsche Main Agent. 23.10.2018 - Service @ 47439 Miles by Porsche Specialist. Current MOT Test runs until 15th January 2020 with NO Advisory items. Emissions 262 g/km Co2 - 6 Months Road Fund Licence = £305.25 - 12 Months = £555.00. 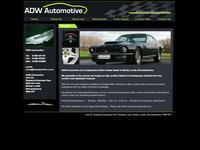 Bodywork is in Very Good Condition - No scuffs, scrapes or annoying pin dents. Interior also presents very well too, as does the Under Bonnet and Boot Storage Areas, with very little sign of any wear. The Carpets have been Covered from New so remain Excellent and are protected with a set of Black Porsche Carpet Mats. Carpet Mats have been edged in Silver as a Finishing Touch. All 4 Alloys are perfect having been Professionally Refinished inside and outside the wheel to OE Standard. The Alloys wear the correct Bridgestone Tyres all round - Front Tyres are New, Rear Tyres have Good Tread Remaining. While the wheels were off we have cleaned the Brake Calipers and painted the wheel hubs - It really sharpens the appearance. All of Our Vehicles are Detail Valeted to a Very High Standard with the Paintwork " Clay " Prepared to remove any Surface Contamination. The Fresh Paintwork has been Detail Polished and Sealed with a Quality Wax. The Interior has been thoroughly cleaned and prepared to the highest of standards without using sticky silicone products !. 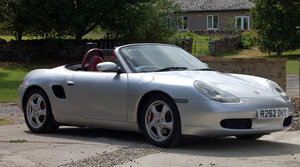 In Summary, a Great Value for Money Porsche Boxster S 3.4 Convertible. This is a 2007 Model Year car so not only does it have Enhanced IMS protection, it also has the more powerful 295 BHP 3.4 engine. 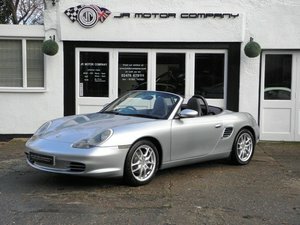 Great Specification with Optional PCM 2 DVD Navigation, Telephone Module, Leather Interior, 19 " Carrera S Alloys, PSM, Bose Sound Package, Park Assist, Wind Deflector etc. Very Comprehensive Service History and Very Recently Serviced - Next Due in October 2020 or 67439 Miles, whichever comes first. Looks Stunning in Cobalt Blue Metallic with the 19 inch Alloys. Genuinely hard to find in this Condition, with such a High Specification, Comprehensive Service History, and Very Low Miles. Ready for you to enjoy the summer season. Supplied with 2 Remote Keys along with all Service / Vehicle Handbooks and with a History File containing a VOSA MOT Report showing all MOT,s to verify mileage and a Full Experian Auto-Data Report to confirm the vehicles good provenance and to confirm the vehicle has no adverse information recorded against the following registers : Stolen, High Risk, Finance, ABi Condition Alert, Scrapped, Plate Change, Export Data, Import Data, Extra Data. Supplied with 3 Months Parts and Labour Warranty which can be upgraded at extra cost up to 36 Months. Available to View undercover in our comfortable showroom. Viewing by Appointment - Please call 01299 251151 or 07899 928035 ( Rob ) to make an Appointment to View or to discuss further. Part Exchange Welcome. Licensed Credit Brokers - Competitive Finance Facilities Available over 24 to 60 months - Subject to Status - Written Details Available on Request.